Indian Festivals are a celebratory way of thanking the Divine for providing us with everything that we have and also to seek blessings for continued prosperity. As people, say it is us in India who worship anything and everything and it takes a helluva lot of maturity to do it. We have been taught to respect even non-living things are divine, let alone living beings. On my last leg of my stay in Chennai, my karma Bhoomi, here is a tribute to the culture and people of Tamil Nadu. And what better way than to elucidate my expereince of spending the previous Pongal in the countryside. Thanks to a colleague and her parents who invited us over to their home in Kovilpatti and gave us an experience of a traditional Pongal festivities, its significance and lessons for us. Pongal is one of the biggest festivals celebrated in Tamil Nadu. It marks the beginning of Sun’s journey towards the north (Uttarayana – which according to Hinduism is considered very auspicious phase as opposed to Southwards – Dakshinayana traversal of the sun). Pongal is celebrated with lot of pomp and gaiety over a period of 4 days. Since the Souramana calendar (Western Calendar based on the Solar phases) is followed, the dates usually remain the same i.e. Jan 13th to Jan 16th of every year. (the Makara Sankaranti) is the first day when Uttarayan begins. This day is called the Surya Pongal and begins with the worship of the sun. We the city folks woke up to find the whole home a buzz of activity, the courtyard beautifully decorated with colourful Rangoli. This festival is a thanksgiving to the Divine for the abundant harvest and in turn prosperity bestowed. 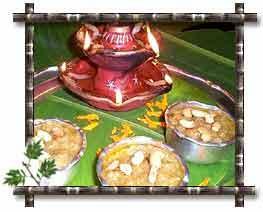 Pongal literally means “Rising up” and by extension refers to “Boiling over”, signifying abundance of prosperity. The freshly harvested crop (rice in TN) is cooked and allowed to rise over the brim of the pot and boil over. Yummm….the aroma was so mouth watering and we could not wait for the rituals to get over (our hostess saw the obvious impatience on our faces and went through the rituals in express speed – she clarified she never skipped any processes). The platain leaf on which it was served was almost licked clean by all of us. The fourth day called, Kaanum Pongal is devoted to meeting up other members of the family and paying their respects to the elders of the family offering them new clothes with a Dakshina. This is the day our host also left some food out on the terrace for the crows to eat. She said the belief is that the crow carries the food to the departed elders of the family. This was quite emotional because it was carried out with so much of feeling and intensity and we had to believe that the crow indeed carried the delicacy prepared right to the stomach of the departed souls. We should turn away from the darkness of hallucinating worldly experiences in which we live, allow the light to enter us and make us shine brighter. We should gradually begin to grow in purity, wisdom, and knowledge, even as the sun does, from the time it rises everyday. Thanking the divine for all the good bestowed to us. Worshipping the sun which just goes about doing its duty without expecting anything in return. Worshipping the cattle signifies our appreciation of the part they play in our betterment of our lives. Sharing, caring, appreciation, expression of gratitude, respect for elders and most importantly considering everything around as valuable. This year, it was a special one for us in Chennai. Divya (Akhila) my daughter appeared on a local Television Channel performing for the Pongal Special program. She presented a folk dance (with a dash of Bharatnatyam) She made us proud with the rave reviews she elicited with her superb performance and our phones has never stopped ringing ever since the telecast……trrrrrinnng triiiinnnnggg…..let me rush, another phone call…..